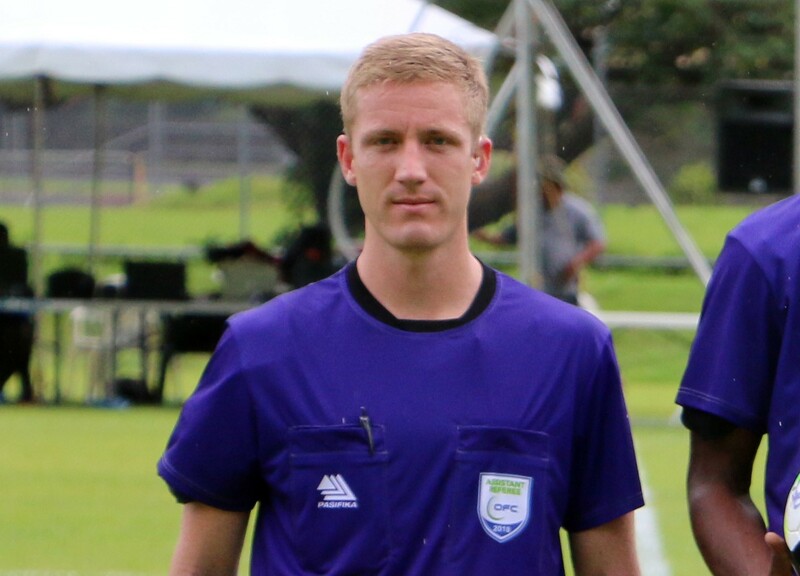 New Zealand assistant referee Hayden Tutbury had an unusual journey to the OFC Champions League 2018 Qualifier in American Samoa after being called upon to assist in a different manner than expected. What started as a routine flight out of Auckland to Apia was soon anything but as Air New Zealand staff put out a call for medical assistance. Tutbury immediately offered his assistance, along with a nurse, to a fellow passenger who was experiencing chest pains. “I am not a doctor, but I am medically trained so I could offer my assistance,” Tutbury said. “I went up took his blood pressure, and his pulse and worked with Air New Zealand staff to relay the information back to a doctor in Auckland. “There was also a nurse on the flight and we both sat with this gentleman, basically just to monitor him, and the doctor was relaying to us what we should do. “He was feeling quite numb down the arm, he had chest pain so quite typical of a heart attack,” Tutbury said. Although it was a high-pressure experience for the 25-year-old, he was just pleased he could help. “All through our training we were advised, ‘if there is something happening, go and help, lend a hand’. “So I just got up and asked what they needed. They asked if I’m a doctor, and I said no, but I’m medically trained,” he added. The other passengers were very pleased the situation was able to be resolved without having to return to Auckland. As was Tutbury himself, who was able to continue on and make his regional debut as a match official. “Fortunately it did not affect my preparation at all,” Tutbury said. Tutbury has officiated in two matches at the OFC Champions League 2018 Qualifier in Pago Pago and hopes he will again be involved in tomorrow’s final match day.